Broadway around 19th Street had drastically changed in 1895. Tall commercial buildings replaced the proud brownstone mansions that once lined the street and high-end emporiums lured wealthy shoppers who now lived further uptown. There was no trace of the fashionable residential neighborhood of a generation earlier. Except for the brooding brown mansion at the northeast corner of Broadway and 19th Street where a single elderly woman sat behind closed shutters in constant twilight. The house was built by Cornelius T. Williams around 1830; the same year that he fought the city’s plans to intersect his immense property with streets and avenues. The hulking four-story mansion was designed in the relatively new Greek Revival style. The handsome cast iron balconies that hugged the parlor-floor windows and the dignified, columned entrance were the only ornaments to the otherwise staid home. Williams’ house was nearly centered on the lot, surrounded by grassy yards and gardens and protected by a high iron fence. To the rear, a large glass-enclosed conservatory extended into the gardens. Despite his protests, Williams would see his land developed. He had already given up land for Union Square to the south and in 1831 he would sell land to Samuel B. Ruggles to become part of Gramercy Park. In the meantime another family was accumulating Manhattan property. Brothers Peter and Robert Goelet inherited valuable land acquired by their father and grandfather. They continued the family policy of investing in real estate, paying close attention to the trends of the city’s expansion and development. Their property holdings would become among the most extensive and valuable in the city. To ensure a supply of fresh milk, Goelet kept a cow in the backyard. During winter the animals were housed in the stone Gothic Revival carriage house. Preferring his solitude, the wealthy landowner would spend his evenings in his basement shop where he had a forge and machinery. Henry Hall noted that here “he manufactured, after the fashion of one of the Kings of France, various sorts of machinery, but particularly locks and curious and intricate patterns.” Goelet installed his inventions throughout the house, never seeking patents or outside manufacture of his ideas. The Goelets had two sisters, Hannah and Jean. In 1835 Hannah married United States Naval officer Thomas R. Gerry, son of the former Vice President of the United States, Elbridge Gerry. The couple had a son, Elbridge T. Gerry who would become Commodore Elbridge Gerry, founder of the Society for the Prevention of Cruelty to Children. When Thomas Gerry died in 1845, Hannah moved in with Peter and the two of them would live in mysterious seclusion for the rest of their lives. Myers called Goelet, “very melancholy and, apart from his queer collection of pets, cared for nothing except land and houses.” Indeed, when not tinkering with his inventions he spent his time pouring over his ledgers of property. He kept one cardinal rule: never sell a foot of land. One by one, the mansions along Broadway fell victim to encroaching commerce until the house where Peter and his widowed sister lived was an isolated anachronism. “The extraordinary spectacle of a cow, storks, guinea-pigs, and other animals, feeding quietly in the busiest and most bustling part of Broadway, was one that attracted every stranger’s curiosity, and during the fine days in Summer it was no uncommon thing to see a considerable crowd gathered in front of the house gazing through the iron railing at the unwonted sight within,” mused The Times years later, in 1879. Peter’s immense fortune, estimated at $6 million in 1861 had doubled in 1873, despite the crippling financial panic of that year. In 1878 Goelet’s physical condition declined. The New York Times explained it, saying “His complaint, which was nothing more complicated than general decay consequent upon advanced age, confined him to his residence.” A year later in late October he became seriously ill and he died in the house on November 22, 1879. Peter Goelet’s brownstone mansion was passed on to his niece, Mrs. Elbridge T. Gerry, Hannah’s daughter-in-law. Unlike the rest of the family who, as The Lewiston Daily Sun noted on June 5, 1893, “have left the old Goelet homes and live in brownstone palaces farther up town in the ultra fashionable quarters,” Hannah stayed on in the house, tended to by two loyal servants. The family did not pressure the aged woman to leave and she remained on as if time had not already passed her and the old house by. The cow and the peacocks had long disappeared. The stone carriage house had fallen into ruin. “Its once fanciful windows are shattered, its ornamented timbers are rotting and crumbling away, and the door on Nineteenth street has not swung on its hinges for a half dozen years or more,” said The Lewiston Daily Sun. “The house exists because its occupant lives,” the newspaper said. Within two weeks Hannah Gerry was dead. Not long afterward, the crumbling Gothic Revival carriage house was demolished “to make way for a business structure,” said The Times. 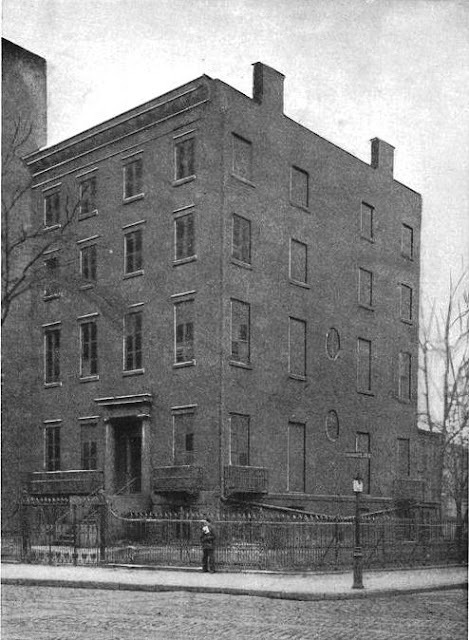 Where an eccentric millionaire’s brownstone mansion had stood a massive eight-story brick-and-stone building arose. And before long, the memories of peacocks, a cow, and the haunting visage of a lonely reclusive widow faded away. A magnificent post. It combines a vivid reading of the history, an excellent illustration, and a wonderful literary style. Following your blog is a constant joy and pleasure. You do amazing work. I know that WHENEVER I am able to get to New York, ( I have a tattoe that states "New York", and will put the date when....)some of these landmarks will still be there, but as I will pass by the places and homes you have written about, I know I will "feel" them, as I will have "their" stories with me. I have kept many of your postings with me, and since I a huge fan and lover of these old buildings, I look forward to always visiting your site and "going into a long ago and beloved" time in our history. Keep it up! !